A die-hard rockhound, lapidary, and wire jewelry designer, instructor and author, Dale credits her mom for spurring the main interest that led to Dale's chosen career. Her mother was an avid rockhound and many, weekend family adventures involved traipsing through the White Mountains of New Hampshire in search of abandoned pegmatite mines. This is where Dale’s fascination with, and education of rocks and minerals began, some 40 years ago. Dale/Cougar, has a diverse art background, training in two-dimensional art with Carl Haskins of Vermont, and William Keyworth of New Hampshire. She also spent several years receiving personalized instruction with Karl Drerupe, renowned cloisonné and repossé artist. Dale attended the University of South Florida where she studied fine arts and geology. She worked as a technical, advertising artist for several years, ‘before the age of computers’. With more than 40 years of combined experience, Dale uses absolutely no solder or glue in her traditional wire jewelry designs, and teaches how at jewelry making events in North America, Russia, Ukraine and Switzerland. Her award winning work is sold in galleries and has appeared in many printed publications. Author of numerous magazine and Internet articles and the bestselling book, “Wirework: An Illustrated Guide to the Art of Wire Wrapping”, Dale has made several series of instructional DVDs for, and is the Education Consultant emeritus of Wire-Sculpture.com. 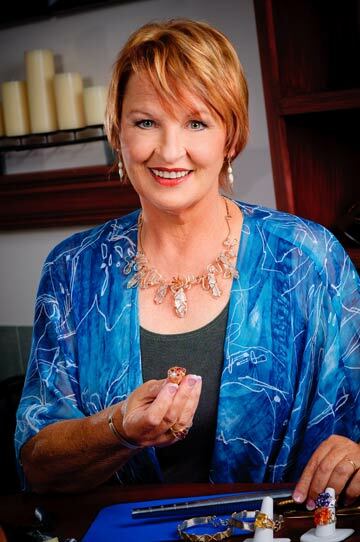 She has appeared on the PBS broadcast show ‘Beads, Baubles & Jewels’; is a member of the Beadalon Design Team; a Euro Tool representative; has made instructional DVDs for, and also works as an instructor and live presenter for Jewelry Television. When she is not teaching or writing, Dale creates new designs in SE Tennessee where she enjoys her family, furry friends, gardens and tons of rocks.